No matter who you are and no matter what your hair type, you will deal with split ends. It is just a part of how our hair operates. So the big question becomes, how often should you be making a trip to the hair salon to get it trimmed? You have probably heard multiple numbers thrown around like every 3 weeks or even every couple months, but we gathered up all the professionals at Charleston hair and makeup to finally come up with a cohesive list on when you should be getting your hair trimmed for your specific hair type. One thing we want to make clear before going into our list is that no one is exempt from getting split ends. 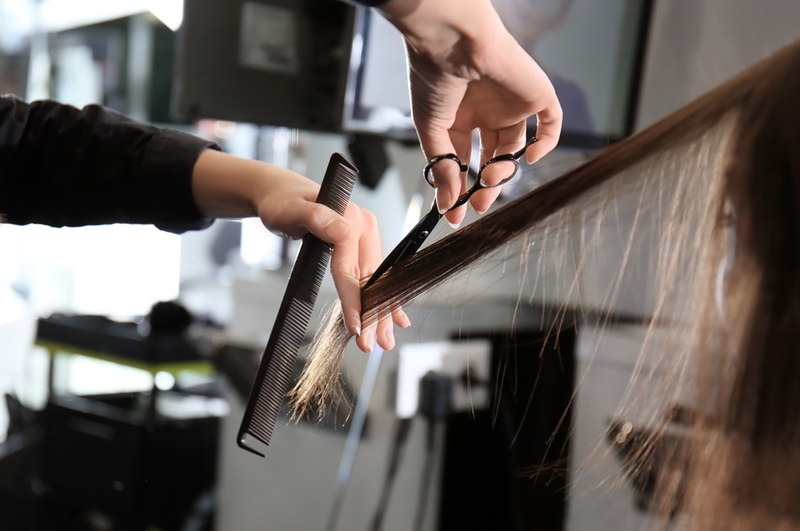 You could be following a hair treatment routine religiously and still experience split ends. It is just a part of how our hair grows and operates. That being said, let’s jump into the different hair types and when to get them trimmed. Fine hair can be difficult to deal with and add split ends onto that, it can look even thinner. For this hair type, you have maintained a strict trimming routine to keep your hair looking healthy and full. Our professionals at Charleston hair and makeup recommend that you should trim fine hair every five weeks. This is especially true during the colder months when your hair is having to battle the harsh weather as well. This hair type can is a little bit more lenient on how often you should get it trimmed, and the great thing that comes with curly hair is that your hair will help let you know when a trim is necessary. When dealing with curly hair, a good rule of thumb is that when your hair begins to tangle and knot into each other it is time to get those split ends trimmed. Sure, you could use a detangler before styling your hair to help comb through the knots but that will only damage the hair more creating more split ends. Some of our regular clients at the hair salon who have curly hair come back roughly every six to eight weeks for a trim. If you just listen to your hair, then you will get a good idea of when it is time to get a trim. Because color-treating your hair will add chemicals into your hair, you will experience breakage faster than natural hair. Add on top of that straightening procedures and you have a double whammy. To avoid a head full of damaged and split ends, you should be getting a trim every time you a receive treatment to your hair. Say you go back to your stylists every four weeks to touch up your roots, add a trim in there and you won’t have to be concerned with split ends a week or two later. We all have eyes and can see when split ends begin to take over our hair, but preventive trims can help you avoid your whole head being taken over. Listen to your hair when styling and you will never have to worry about this issue, no matter what hair type you are dealing with.